plan ahead + book your Holiday PARTY EARLY! Eve's Waterfront is available for full buyouts and can accommodate 400 seated, 800 standing. Inquire for availability and rates. 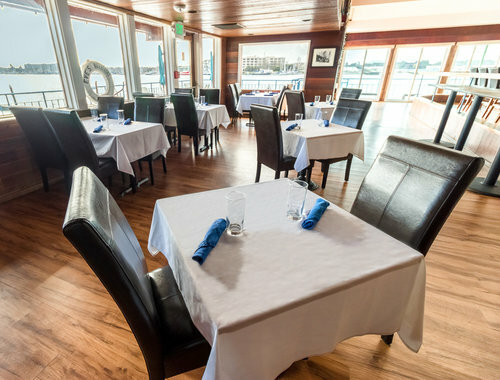 Eve's main dining room, "The Waterfront" has a capacity of 120 seated and is perfect for any special occasion Click here to inquire for availability and rates. Perfect for a ceremony, the Waterfront Deck comfortably seats 60 for outdoor dining and accommodates up to 150 standing. Starboard Hall is the perfect reception area, equipped with seating up to 80. Take in break taking views of the harbor and Jack London Square from the windows. Port is the perfect space for the casual corporate mixer after work. Direct access to the bar and panoramic views make Port the perfect place for social gatherings of up to 60 seated.